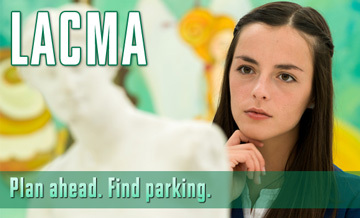 Parking.com has convenient parking near the Los Angeles County Museum of Art. Refer to the map for more information on parking, including rates, payment options, and entrance location. The Los Angeles County Museum of Art (LACMA) is the largest art museum in the western U.S., with a collection that includes nearly 13,000 objects and works of art that span both history and geography. Among the museum's holdings include Asian art, Latin American art, and Islamic art. The museum is located in Hancock Park on over 20 acres in the heart of L.A.